Portable Transistor radio This radio is one of four which were given to a charitable company Furnishaid Limited situated in Great Yarmouth.The aims of the company are to provide recycled furniture to people on low income and to provide training opportunities for people in refurbishment of furniture. As these were unsuitable I made a donation and have added them to my collection. 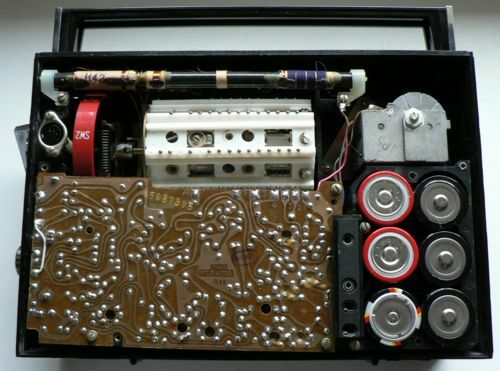 This is a portable Russian made six waveband (up to 21.75mHz) radio with 10 transistors and 2 diodes, sockets for a tape recorder and external aerial and earpiece. This radio is powered by six 1.5 volt cells in series though can be powered from an external power supply. I understand that this model was first produced in 1970. 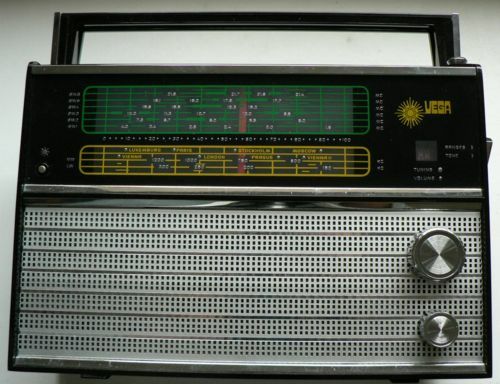 Unusually for a radio of this vintage it has no VHF band. Note the turret tuner and the six 1.5 volt volt cells.